(This article is kindly sponsored by Adobe.) As businesses become more consumer-oriented, competition grows fiercer. Thousands of companies worldwide are struggling each day to gain more market share and to win over new consumers. A significant number of companies concentrate only on acquiring new customers — they allocate enormous marketing budgets trying to strengthen their customer base. But acquiring new customers only becomes harder and more expensive. According to the 2017 Digital Advertising Report by Adobe, ad costs are seeing growth five times faster than US inflation rates. In an attempt to find new customers, companies often forget to think of ways to engage with existing users. However, acquiring a new customer is anywhere from 5 to 25 times more expensive than retaining an existing one. To succeed in the modern market, companies need to do more than produce an excellent product or provide reliable service: They need to turn their faithful users into advocates. Brand advocates are people who feel so positively about a brand that they want to recommend it to others. They’re often called volunteer marketers because they pass on positive word-of-mouth messages about the brand to other people (both offline and online). Advocates do it organically — money is not the primary reason why they promote a brand or product; they promote it because they truly believe in the brand. Brand advocacy is the modern form of traditional word-of-mouth marketing. And word of mouth about a product or service is one of the most powerful forms of advertising; when regular people recommend a product, their message carries more weight than a paid advertisement. According to a McKinsey study, word of mouth can generate more than double the sales of paid advertising. Social proof plays a vital part in the process of product selection. Reading reviews and testimonials is the first step potential users make when researching a product; reviews and testimonials play a role in the wisdom of the crowd. And advocates can be excellent sources of reviews and testimonials. According to Google, 19% of brand advocates share their experiences online in their networks — twice as many as non-brand advocates. Advocates use the power of social channels to amplify a brand’s exposure. As a result, they can reach out to people you might not have considered. Advocates can provide valuable customer insights. Their insights can help you formulate more focused, customer-centric product road maps. Many people confuse loyalists and brand advocates. Brand loyalists and advocates aren’t the same groups of customers. Loyal customers are people who stay with your brand. For example, if you run an e-commerce store, loyal customers will be your return buyers. But they might not actively promote your brand to others (i.e. they might not be comfortable with sharing information about your brand publicly). Advocates, on the other hand, are people who not only are loyal to your brand, but also proactively talk up and advocate for your company to their own networks. The word “proactive” is key here. Advocates invest in the success of your brand heavily. The goal is to turn brand loyalists into brand advocates. Who Has The Potential To Become A Brand Advocate? Promoters are people who participate in an NPS survey, a single-question survey that sounds like, “On a scale of 0 to 10, how likely are you to recommend us to your friends, family, or colleagues?”, and who answers 9 or 10. These are existing customers who refer new users to your product. Repeat visitors are highly engaged and interested in the content you provide. These are people who share your content on social media on a regular basis. Critics leave feedback about your product or service. However, your customers are not your only advocates. The best brand advocates are people who work with you: your employees. Communications marketing firm Edelman found that 52% of consumers view employees as very credible sources of information about a brand. Getting customers to advocate for a brand is a lot different from getting them to buy products or services. Users don’t become advocates without reason. To acquire a brand ambassador, companies need to create the conditions that generate not only happy customers, but true customer advocates. Pushing people towards a particular type of action typically results in them doing the opposite. Don’t try to force advocacy; it should be completely natural. Designing for the user experience has a lot more to it than making a product usable. It’s also important to generate a certain positive emotional effect while people are using a product. After all, user experience is about how users feel when they interact with a product. As humans, we establish some sort of an emotional connection with all of the products we use. It’s possible to establish a deeper connection with a product by adding elements that generate positive emotions at multiple points along that journey. Pleasure is at the top of Aaron Walter’s pyramid of emotional design. Designers should have a goal to please their users and make them feel happy when they use the product. 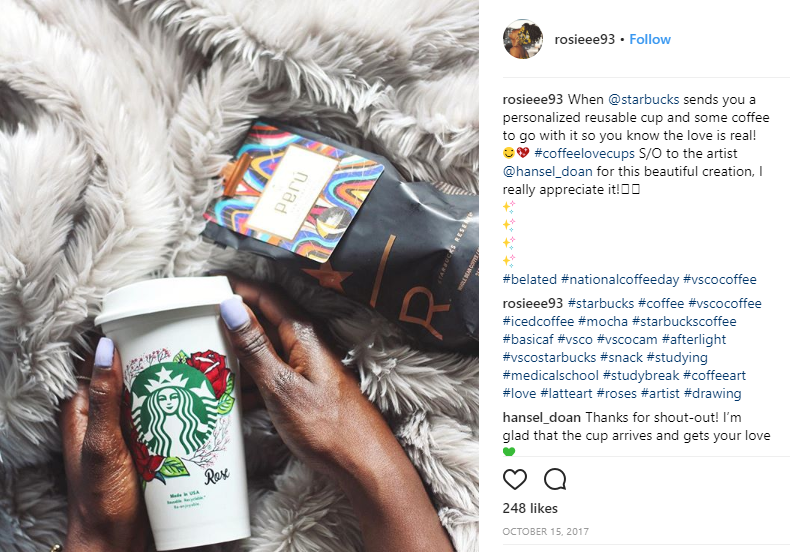 The reward for brands that connect with customers’ emotions in a positive way can be substantial. People love to talk about products that make them happy. Duolingo is an excellent example of incorporating delight in UX. What makes Duolingo thrive is its smooth functionality wrapped in a friendly design with elements of gamification. Each lesson is presented as a challenge to the user. 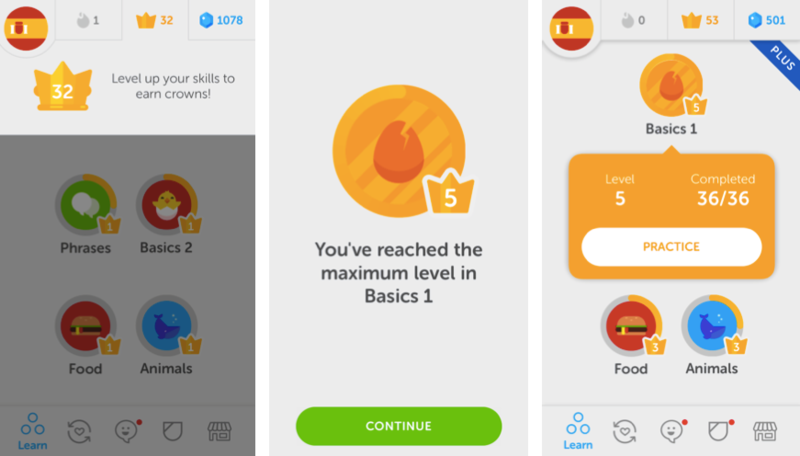 When users accomplish a task, Duolingo celebrates this progress with the users by rewarding them with a badge. By presenting the learning process as a challenge, the service creates a sense of development and accomplishment. The latter has a significant impact on delight. 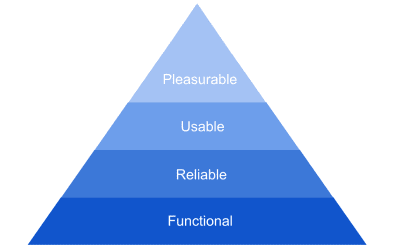 Evoking a positive emotional response in users is key to creating a delightful UX. Duolingo transforms the task of learning a new language into an inviting experience. This motivates users to level up and achieve mastery in the discipline. Advocacy is always a risky business. When discussing a company, advocates are putting their reputation on the line. They know that if something goes wrong, people will blame them for it. But one thing can alleviate those fears: trust. The more they trust you, the more easily they will recommend your product. Below are a few things that play a significant role in building trust. Deliver what you promise, and promptly solve problems when something goes wrong. That’s the obvious starting point, but you’d be surprised at how many fail to execute well on this simple principle. Casper, an e-commerce company that sells sleep products online, is an excellent example of a company that exemplifies trust. Ordering a mattress on the Internet isn’t a simple thing. A customer might try a product and find that it’s not good for them. The company understands this and offers an extended trial period (customers can test a product for 100 nights) and an incredibly lenient return policy. By making returns as simple as possible, Casper makes the process of ordering a mattress as comfortable as possible. Casper not only stands by its products, but also trusts its customers to be honest when requesting a refund. When customers interact with a brand, they expect to have a dialog, not a monologue. They want you to listen to them and demonstrate that you care about them as individuals. This is especially important when users face problems. Users should be able to reach a company through whichever channel is most convenient to them at the time. Whether they prefer face-to-face communication, email, a phone call or a message in a social network, make sure you’re available by all those means. 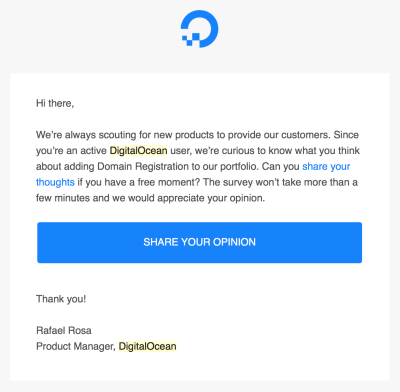 Asking users for feedback not only is one of the best ways to gain insight into your business, but is also a great way to build relationships. When you ask users for feedback, they understand that you actually care about them and want to make their experience better. However, the way you ask for feedback plays a vital role in how users react to it. Generic surveys with questions like, “Are you happy with our service? Answer yes or no” won’t deliver many insights. You need to research users problems first, get to know what is bothering them, and only after that ask questions that your users will be happy to answer. 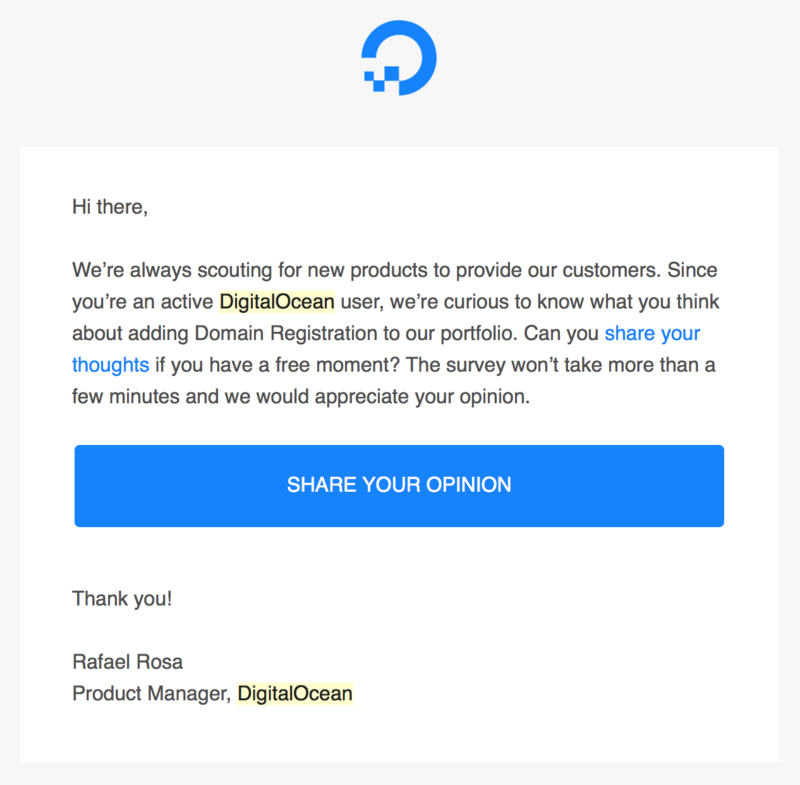 DigitalOcean makes users feel that their opinions carry weight. Find the right time to ask for a review. The request for a review should be a natural part of the customer journey. Booking.com makes asking for feedback a natural part of the user journey. When Booking.com users check out at a hotel, the service asks them to review their stay. Product reviews can act as social proof and encourage prospects to convert. The best reviews not only describe the pros and cons of a product, but tell a story of how the product benefits the user. A loyalty program might come in handy when users face a problem and complain about it. Of course, it’s essential to respond to the user request and provide a solution to the problem as fast as you can. But once the issue has been resolved, you can offer the customer loyalty points as an apology. This might help you to win back frustrated users, and maybe they can even advocate for your brand. Motivate users to participate in social activities. For example, reward users by awarding loyalty points every time they tweet or post to Facebook, write a review, or refer their friends. turn existing customers into brand advocates. Moreover, studies confirm that referred customers are more valuable than customers acquired by other methods; they tend to yield higher profit margins and stay longer (they have a 16% higher lifetime value than non-referred customers), resulting in an overall higher customer lifetime value. The critical point with a referral strategy is to find out the right incentive to make users spread the word about your product. 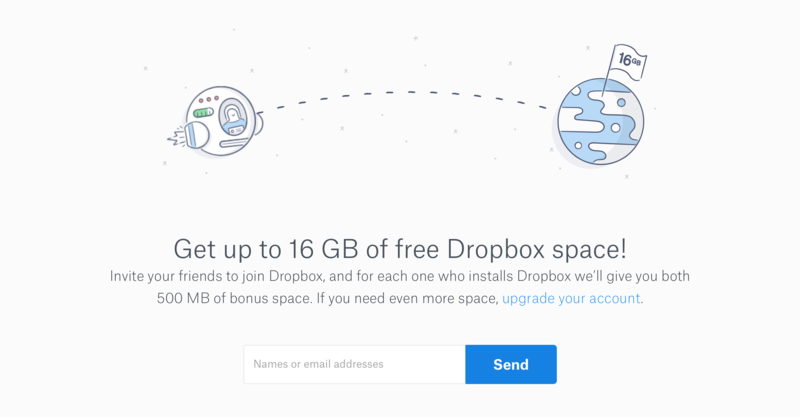 Dropbox’s referral program is possibly one of the most famous cases of referral marketing done right. The service grew 3900% in 15 months with a simple referral program. When existing Dropbox users referred Dropbox to someone and the person signed up, both got extra free space. Apparently, Dropbox’s tremendous rise is not all due to the referral program; the service provides an excellent user experience, and the team continually improves its product. But the referral program was a great accelerator of the process of promotion. Dropbox offered a two-sides referral program. Both advocate and referrer are rewarded for completing the desired task. 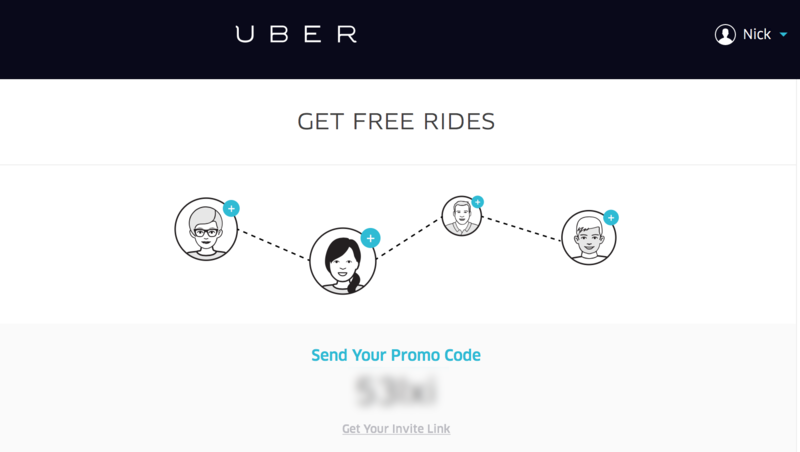 Uber is an excellent example of how a referral program baked into the service from day one can boost adoption. When Uber launched, it was quite a revolutionary service that brought the sharing economy to the transportation industry. People had to adapt to this new format of ridesharing — many potential users had doubts that stopped them from trying the new experience. The referral program was an excellent tool to alleviate fears. The incentive for participation in the program is straightforward: The service offers a free ride to both the referrer and the new rider upon a successful referral. A free ride is an excellent opportunity to get to know the service. This way, Uber gives new customers the perfect introduction to the service. Both Dropbox and Uber integrated the referral program very naturally into the product experience. For Dropbox users, the referral program is presented as the final step of the onboarding process — at the point when users already know what benefits the product brings to them and when they’ll be most likely to participate in the program. 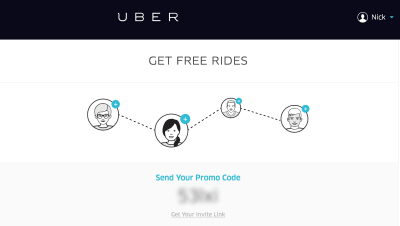 As for Uber, the referral program has its own option in app’s main menu. It’s possible to make the experience more personal by gathering information on customers and using it to deliver more relevant content. For example, you could have an intuitive interface that adjusts exactly the way the user expects. Netflix is an excellent example of earning loyalty based on providing a personalized experience. The service offers content suggestions based on the user’s viewing history. 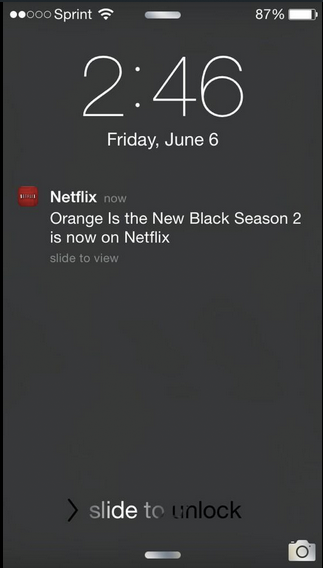 Netflix also notifies users when new seasons of their favorite TV shows are released. Netflix does a great job of personalizing its mobile push notifications. The power of word of mouth created by brand advocates is amplified through social media. In fact, if there’s one place your company should look for brand advocates, it’s on your social media channels. Today, 70% of Americans use social media channels to engage with friends, family and the people they know. Thus, it’s essential to practice social listening — listen to what your current customers and advocates are saying about your brand — and respond to their comments accordingly. It’s extremely important to know where your audience lives on social media and where potential advocates could have the most influence. Before posting anything on social media, ask yourself two simple questions, “Does it benefit our company?” and “Does it meet our audience’s needs?” Ideally, you should post content that both reflects your business’ goals and satisfies the needs of your target audience. Recognizing and responding to positive feedback is particularly important over social media. Reward the people who stand out in your community. If you have a customer who wants to engage with you, engage with them. Give them as much love as they’re giving you. Users giving positive feedback about your brand is by far the best brand promotion. 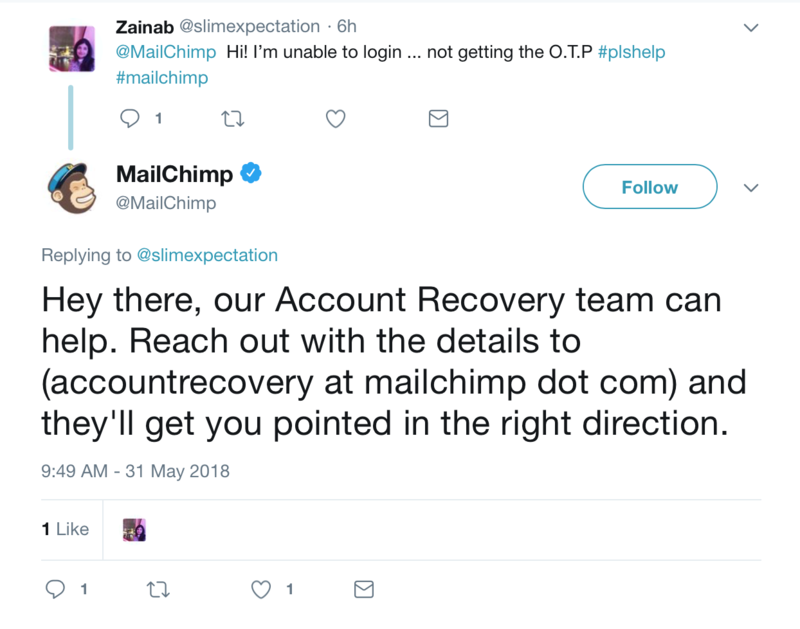 MailChimp responds to positive customer feedback on Twitter. 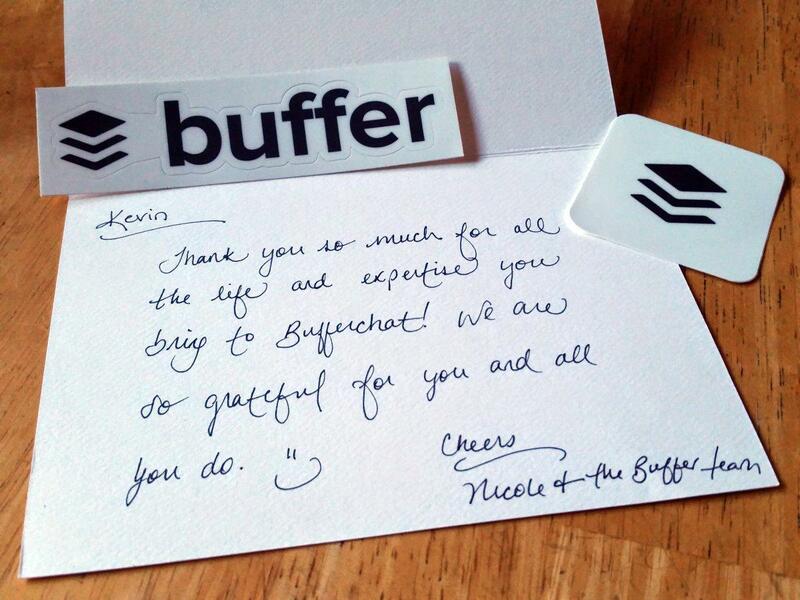 One of the best ways to push customer advocacy is through user-generated content. It’s great for brands because one piece of user-generated content can reach thousands of people within hours. And it’s great for users: Being mentioned or having content shared by a brand is really exciting for many consumers. 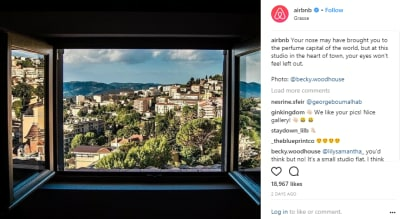 Airbnb is an excellent example of how user-generated content can be a vital part of a brand’s content. In the company’s Instagram account, Airbnb shares stunning photos captured by its customers. The photos include exotic locations, and this kind of content is highly attractive to prospective customers. Sharing user content helps you get to that user’s audience. Airbnb uses such content to show off its users’ talents behind the camera. When users have a problem with a product, they often post questions or complaints on social networks in the hope of getting a quick response. It’s tremendously important to address every concern users have about your brand. By solving their problems, you clearly demonstrate that your brand is genuinely addressing customer concerns. Just imagine the effect when you resolve an issue on Twitter, Facebook or Instagram, and the happy user shares the whole conversation with their friends and family. The benefits will be priceless. Thus, the more you interact with people and solve their issues on social media, the more value you will provide to them, and the more they will like you. 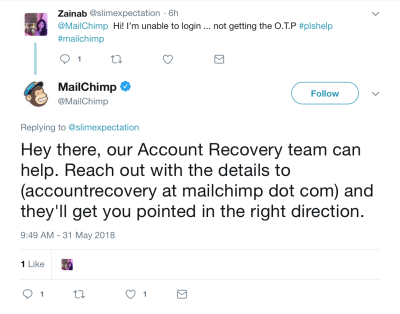 MailChimp deals with user problems on Twitter. It brings a community together. It helps you create great content relevant to your brand. 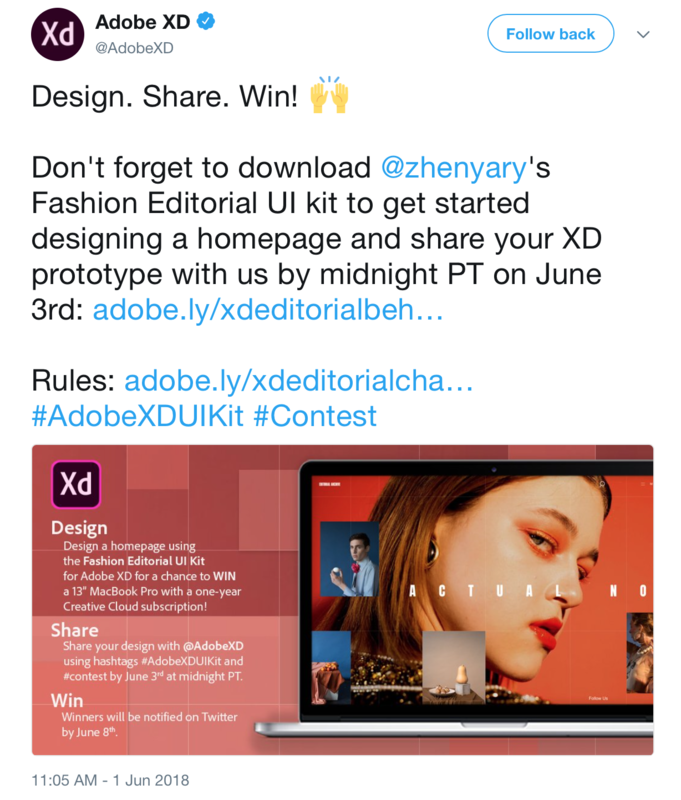 In Adobe XD’s promotional campaign on Twitter, designers share their work with Adobe XD using the hash tag #AdobeXDUIKit. Monitor your social media channels to identify people who are frequently mentioning your brand, and reward them with personal messages or gifts. Reward users for connecting and interacting with your brand on social media. Starbucks sent a personalized, reusable Starbucks cup to one of its loyal customers to thank her for promoting Starbucks’ products in her Instagram posts. Encourage your users to share their achievements in the app on social media. Every once in a while, give users a shout out by sharing their posts on your page as well. Such encouragement can play a key role in making other people do the same. Just make sure the spotlight is on their accomplishments, not your product. 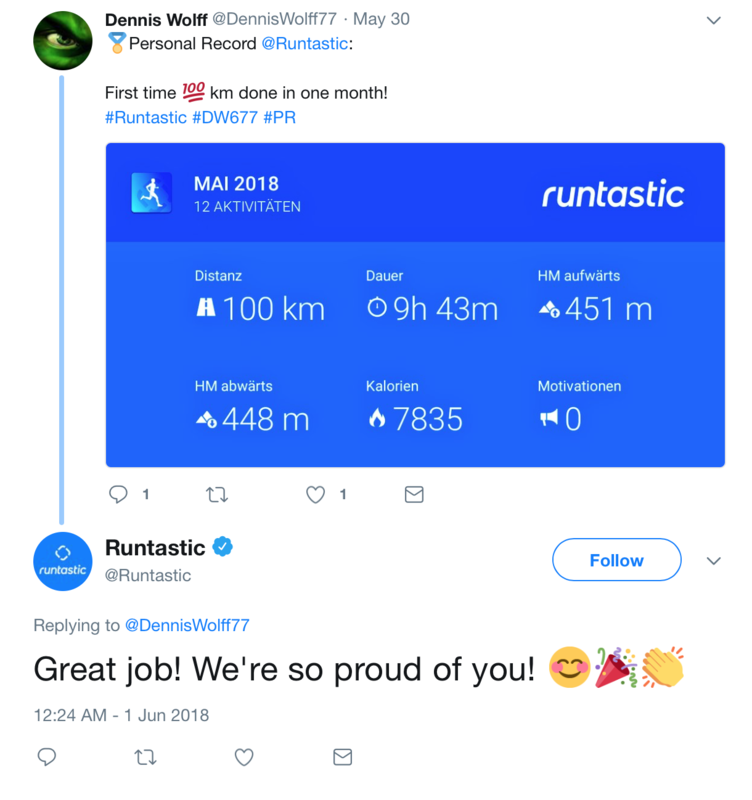 Runtastic (an app that tracks the number of kilometers a user runs every day) is a great example. The app encourages users to share their run with friends on social networks. Users love to share their progress with their network because it makes them look good. Encourage your followers to share special moments. 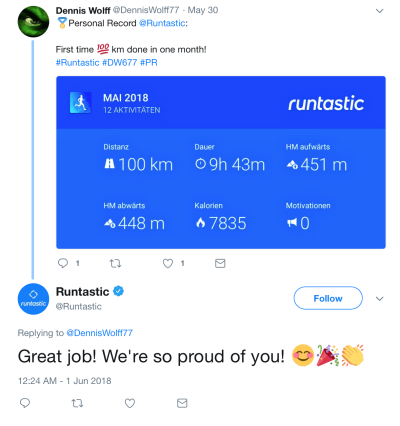 Runtastic encourages its users to share their accomplishments on social media. Your employees can help you amplify the brand’s message. According to Weber Shandwick research, 30% of employees are deeply engaged and have a high potential to be employer advocates. Moreover, the leads generated by an employee through social networking convert 7 times more often than other leads. Train your employees on social sharing activities. Organize seminars to educate your employees on the importance of social sharing and how they can participate in this activity. Incentivize participation in social activities. Provide benefits to frequent sharers and referrers, and acknowledge them in company events. Practice co-creating content with your employees. Give your employees more opportunities to be involved with your brand by sharing their own messages that reinforce business goals. Help them build their personal brand. When your employees gain enough credibility to market your company, the impact of promotion will be much higher. Every brand should help customers to become more experienced in what they do. One way to help your customers with their professional advancement is to provide educational opportunities. Today, many big companies are focused on creating content that will help their users. 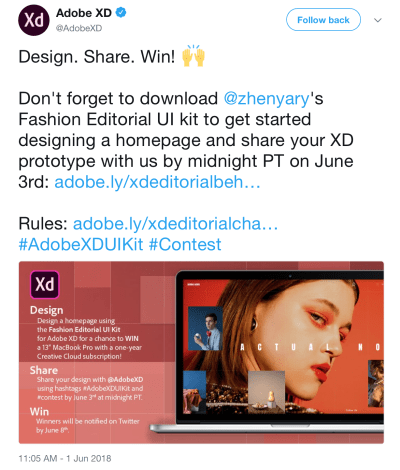 For example, Adobe offers a magnificent suite of products for designers, but it isn’t only the products that make the company recognizable; it’s the content it publishes. Adobe runs a blog that offers free in-depth educational content that helps thousands of designers create better products. 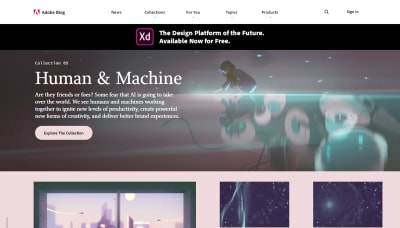 Hundreds of thousands of designers return to Adobe’s blog every month to learn more about design. Readers recognize and love the brand because the blog posts help them in what they do. One of the most effective ways to make your users happy (and turn them into brand advocates) is to surprise them — for example, with an unexpected gift. A gift doesn’t mean something expensive. It could be as simple as a handwritten note. 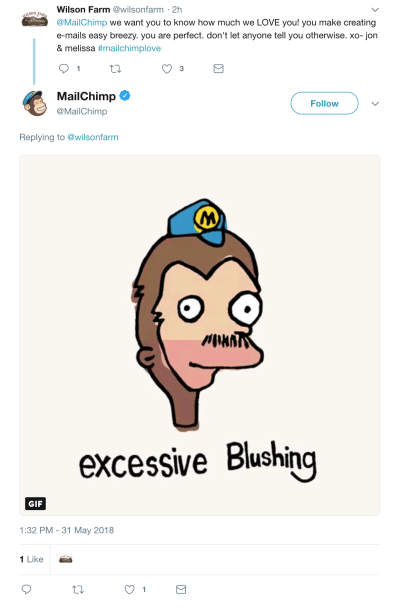 Most users would be delighted to receive such a gift because they understand that it takes time to write a personal message. Give your customers such a surprise and they’ll want to talk about it and about, more importantly, its sender. We’ve just reviewed a great list of methods to boost brand advocacy. But which methods should be applied in your case? Unfortunately, when it comes to creating a brand advocacy program, there’s no silver bullet that turns customers into enthusiastic advocates. Each company has its own unique set of requirements, and it’s impossible to provide a one-size-fits-all solution. But it is still possible to provide a few general recommendations on how to create an advocacy program. Without clear goals, your chances to engage advocates decrease significantly. Before you get started, know what you want to achieve from your advocate marketing program. What do you want advocates to do? Choose advocacy goals that align with your overall business objectives. For example, if your top business goal is to increase conversions, then one of your top advocacy goals could be to get more high-quality referrals. The number of comments, likes and mentions on your channels is a signifier of success. Get more high-quality referrals that result in increased sales. By tracking keywords associated with your brand, you’ll know how often people mention your brand and in what context. Quick tip: Use the S.M.A.R.T. goal-setting program to set the most effective goals possible. The goals you define should be specific, measurable, attainable, relevant and timely. Detractors: responses of 0 to 6, which indicate dissatisfaction. Passives: responses of 7 or 8, which indicate moderate satisfaction. Promoters: responses of 9 or 10, which indicate high satisfaction and a strong likelihood of recommendation. The NPS is then calculated by subtracting the percentage of detractors from the percentage of promoters. The NPS can range from -100% (only detractors) to +100% (only promoters). The Net Promoter Score (NPS) is an index ranging from -100 to 100 that measures the willingness of customers to recommend a company’s products to others. While NPS is an excellent base level for measuring customer satisfaction and loyalty, don’t use NPS as a key performance indicator. Jared Spool provides a few valid arguments on why NPS can be considered harmful to business. Figure out the more reliable and actionable ways to measure how customers feel about your brand and its offerings. Also, when it comes to evaluating your advocacy program, focus on measuring retention, not conversion. Customer retention refers to a business’ ability to keep a customer over a specified period of time. Your retention rate can tell you a lot about your user base. The customer retention rate indicates what percentage of customers have stayed with you over a given period of time. While there’s no standard formula for calculating a customer retention rate, Jeff Haden shares a simple way to measure it. Customer retention rate = ((CE – CN) / CS)) x 100, where CE is the number of customers at the end of a period, CN is the number of new customers acquired during a period of time, and CS is the number of customers at the start of a period of time. A business with a low customer retention rate is like a bucket of water with holes in it. 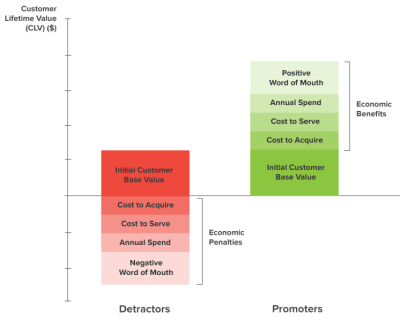 The customer lifetime value is a projection of revenue a business can expect from a customer relationship. Knowing the lifetime value of a customer will help you determine how much money you can spend on customer acquisition; it also enables you to calculate your return on investment (ROI). A customer’s acquisition costs being higher than their lifetime value will often cause problems. If a business runs a referral program, customer referrals are the ultimate proof of your advocacy program. Referral rate = number of coupons redeemed / number of coupons issued. If any user has a personal coupon they can share with friends and family, the formula can be even more straightforward: referral rate = number of coupons redeemed / total number of users. Think of brand advocates as your new sales team. They have tremendous brand value, they drive awareness, and they are capable of persuading people to consider your product. By focusing your efforts on developing brand advocates, you will see an increase in your company’s growth.